There is extra significance surrounding this year’s 13th NPC, running from March 5th to March 15th, because it comes after President Xi has solidified his leadership and the role of the party. There will be a new government line up approved, announced changes on government restructuring, updates on economic growth plans, and new measures for central-provincial relations. § Risk Management: Expect an emphasis on managing risk: especially financial risk. There is a focus now on aiming for quality economic growth, not quantity, after decades of double-digit GDP growth. There are also concerns about corporate debt, as well as municipal debt, that need to be addressed. China has also identified its large trade surplus as a risk that needs to be addressed (and is the mirror concern of the United States). § Poverty Alleviation: In order to achieve a ‘moderately prosperous society’ by 2020, the government is putting a major emphasis on bringing all Chinese citizens out of dire poverty. Urbanization has helped China lift over 700 million people out of poverty in past decades, but with over 30 million citizens still below the nation’s poverty threshold, much work remains. § Environmental Protection: While many benefited from China’s runaway economic growth for decades, it took a huge toll on the environment and has become a source of unrest with the population who have suffered smog, tainted food, and unclean water. Environmental protection and clean up has become part of the work plan for Mayors, Governors and other officials. A major push on green finance combined with a crackdown on polluting factories has already resulted in the development of nascent market mechanisms to promote both energy efficiencies and environmental clean-up. In addition, there will be a continued focus on cleaning up the Chinese Communist Party to build credibility, as well as creating the means through which to govern the country. As reiterated in the 3rd Plenum Communique released on February 28, the Party’s role will be elevated above all other institutions and have oversight on their activities. The National Supervision Commission (NSC) would exert unique authority to oversee all personnel who exercise public power. This is the strongest supervisory measure to date, as its jurisdiction would reach beyond CPC members. NSC operations are already being established at local levels. The Communist Party positions were announced at the 19th Party Congress last October, which gave us insights into appointments for the “executive” and “legislative” branches. The position of President and Vice President will be announced, as well as the Ministers, Chairman and Members of the NPC Standing Committee, the Procuratorate, and President of the Supreme People’s Court. Appointments to the Central Military Commission will be approved, as well. Wang Qishan—former Standing Committee member in charge of the anti-corruption campaign—will be made Vice President, and Liu He, head of the Leading Office for Economic and Financial Affairs, will be made the Vice Premier in charge of finance and trade. 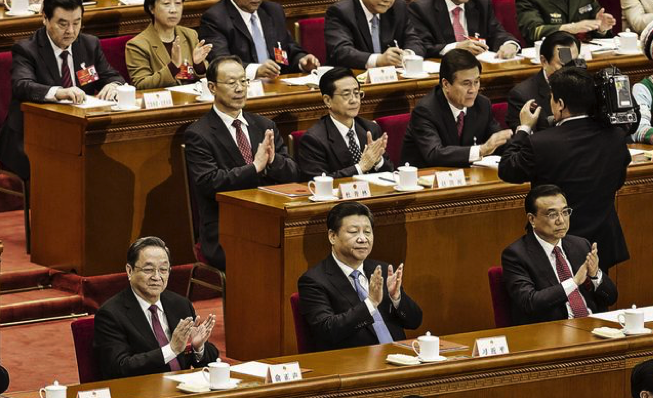 Traditionally, there are four Vice Premier positions, but that could change under President Xi. Others under consideration for Vice Premier include Yang Jiechi, State Councilor in charge of foreign affairs, Hu Chunhua, former Party Secretary of Guangdong Province, and Sun Chunlan, who is a former Party Secretary of Tianjin and would be the only female in the senior leadership, if selected. Han Zheng, currently a standing committee member, will be the Executive Vice Premier. The most important of these comes from the Premier on the state of the economy. Typically, a guide to official thinking on economic growth, China has foreshadowed that they will give a target range—not a specific number as they have in the past. All ministers are expected to discuss their progress in implementing state policies over the previous year. Also, whether announced during this report or in another context, we expect to see a fair amount of government restructuring to streamline ministries and make them more responsive. The lines between the provincial level ministry offices and the main Ministry may be restructured, as well, to reduce local influence over policies.